This comic updates on Wednesday. WARNING: This web comic may contain adult language and violence. A flashback to Zheph's earlier days on the streets. He seems to be a pick-pocket during what seems to be a royal parade. 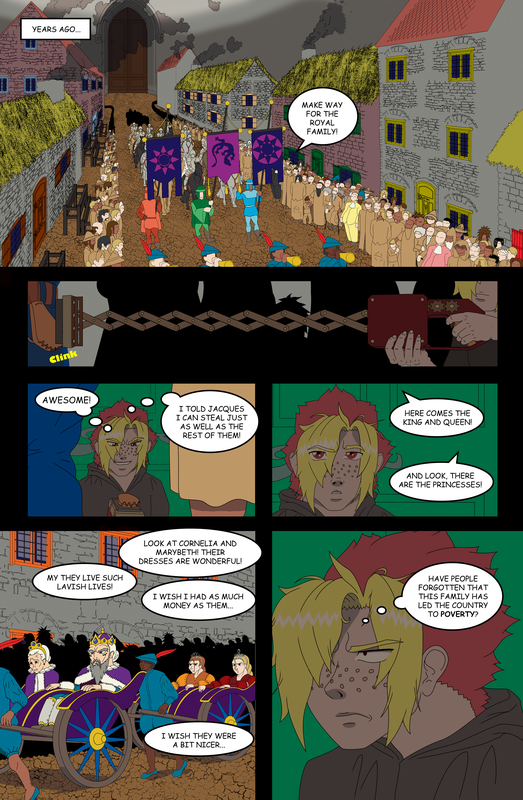 I'm sorry this page had been taking a while, but crowds are hard to draw, even with new technological skills. I have decided to go to Nauticon this year again. I have a new product in mind and I would like some opinions about it. Also, this convention is really fun, so I suggest more people go out to it. I have decided to open a store up with Threadless, which will allow me to have my designs on various clothing items in a variety of colors and sizes. I have also decided to begin writing the whole Zheph Skyre story in a novel format. I might publish it, or submit it to become an animated series or something of the sort. I have started to list numerous things on Amazon.com that I intend to sell. I have already begun to list my comic book collection, Magic the Gathering Card collection, and a certain unused board game I have acquired. I try to sell these items at a decent price, but Amazon has certain fees that force individuals like me to increase the price. If I can figure out how to allow grouping of comic books on Amazon to save on shipping, I will do that. Everything on this website has been edited by Joshua D. Altobelli.